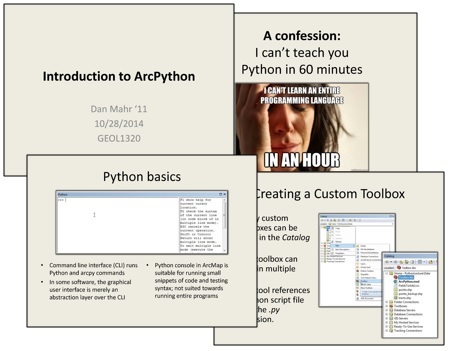 As part of my Bachelor of Science in Environmental Science degree program, I am required to write a senior thesis. After taking GEOL133 in Spring 2010, I knew I was interested in exploring additional topics in remote sensing. My GEOL133 professor, Jack Mustard, got me involved in some of his research examining agricultural extensification and intensification in the central Brazilian state of Mato Grosso. After two semesters of downloading data, learning IDL, processing tiles, testing smoothing techniques, and creating figures, this was the result. I want to thank my advisors, Jack Mustard, Leah VanWey, and Chris Neill for their invaluable help, guidance, and feedback. Additional thanks to Lynn Carlson, Gillian Galford, Xi Yang, Rebecca de Sa, Shelby Riskin, Marcio Caparroz, Peter Klein, and Brett Lien for their help and assistance. 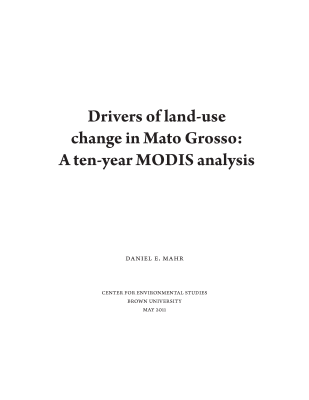 The Brazilian state of Mato Grosso represents a hotspot of large-scale anthropogenic land-use change with major implications for the global carbon cycle, biodiversity, and regional climatic processes. Previous research has documented both the expansion of croplands into the state’s rainforest and cerrado biomes and the intensification of existing croplands through the increased prevalence of multi-cropping. Less closely examined are the socioeconomic drivers of this agricultural growth. In this study, we use the latest version of 250 meter vegetation indices satellite data from Terra-MODIS and a phenology classification algorithm to characterize cropland expansion and multi-cropping intensification in Mato Grosso on a yearly basis from August 2000 through August 2010. We compared these land-use changes to variations in commodity prices, exchange rates, export destinations, and other relevant events. We observed a 25,095 km2 increase in the total area of cropland, while the percentage of cropland classified as multi-cropped grew from 37.6% to 64.4%. These changes correlated most closely to the exchange rate of the Brazilian real to the currencies of its primary soybean export destinations (Europe and China). Significant appreciation of the real since 2009 would suggest decreased cropland expansion and multi-cropping intensification going forward. However, recent rises in commodity prices and sweeping changes proposed to Brazil’s Forest Code may encourage continued or increased land-use change in the near future. This was my final paper for GEOL1330: Global Environmental Remote Sensing, where I used ASTER thermal infrared data to quantify the urban heat island of Providence, RI. Understanding the urban heat island is critical for public health officials, urban planners and policymakers as they shape the future of cities. In this study, thermal infrared ASTER data is used to characterize the nature of the urban heat island in Providence, Rhode Island and how it relates to vegetation coverage. Temperatures in the downtown area on a 22°C August night are found to be approximately 2°C warmer than nearby suburban areas, and 3°C warmer than the closest rural areas. Temperatures are found to be inversely correlated with vegetation coverage as calculated using NDVI. Historical air temperatures are used to ground-truth the thermal data. These values are within the 1.5°C range of precision for the advanced AST_08 product, which takes surface emissivity into account, in eight of ten scenes. The AST_04 product, which does not take surface emissivity into account, severely underestimated air temperature in all cases.